Rep. Ellison: Why is the Democratic Party Afraid to Mention the Israeli Occupation in Platform? | Democracy Now! Rep. Ellison: Why is the Democratic Party Afraid to Mention the Israeli Occupation in Platform? Minnesota Democratic congressmember and co-chair of the House Progressive Caucus. He’s the first Muslim member of Congress. In Part 2 of our conversation with Rep. Keith Ellison, we discuss the Democratic Party’s platform. Ellison was appointed by Sen. Bernie Sanders to serve on the Platform Drafting Committee. AMY GOODMAN: This is Democracy Now!, democracynow.org, The War and Peace Report. I’m Amy Goodman. 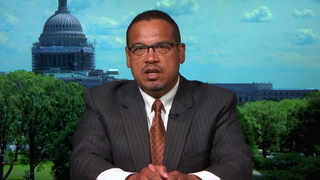 Our guest is Democratic Congressmember Keith Ellison of Minnesota, co-chair of the House Progressive Caucus, the first Muslim member of Congress, a member of the platform committee chosen by Senator Bernie Sanders, also representing Minneapolis, where massive protests have been taking place over the last almost week because of the killing of an African-American man by a Falcon Heights police officer. Congressmember Ellison, we are now going to Part 2 of our conversation about the Democratic platform committee, the Democratic platform. Can you lay out what has finally been decided? REP. KEITH ELLISON: Well, I can—I can lay out in sum, summary. One is that we—that there were six members of the Democratic drafting committee from the Hillary Clinton campaign, five from Bernie Sanders, four from the DNC. We took the base document, and we made several amendments at the drafting committee. We heard testimony over the course of two days. A lot of it was really, really startling and important. I think we have the best statement on Native American rights we’ve ever had. We have strong language that does critique the TPP, although it falls a little short of openly opposing it, which we tried to do but were not able to achieve. It takes a position in favor of $15 and a union for a federal minimum wage. It takes a position on a whole range of things, including the environment, that are progressive steps forward. What did we not achieve? A complete opposition to fracking, we don’t have that. What is else not achieved? There are some things on some foreign policy fronts that I think would and could be better, some saber-rattling with regard to Iran that I don’t think is helpful and good to be in our platform. I think that it would be—I think that we could have had a clearer statement on two-state solution and the U.S.’s aspiration to have peace and security for both Israelis and Palestinians. I think we were a little bit weak on that. AMY GOODMAN: Can you explain what you would like to see there, Congressmember Ellison? AMY GOODMAN: That they’re not using the word “occupation”? REP. KEITH ELLISON: Right. I think that there is a humanitarian crisis going on in Gaza. In fact, you know, the—because of the electricity power plant has been destroyed, the sewage is not being processed, and raw sewage is going up into the Mediterranean. In fact, it’s so bad that it’s flowing up into north, and the Israeli desalinization plant is not able to use its—that plant, because of the sewage that is in the Mediterranean coming from Gaza, because Gaza cannot process their own sewage at this point, because of the horrible situation that is going on there. So, there are some more—so, things like that, I think, really could have been identified much more clearly. AMY GOODMAN: The fracking ban went down? REP. KEITH ELLISON: Yeah, that happened. But I think it’s also important to note that the base document that we started on did not mention the term TPP at all. And so, we went from the drafting committee, where we did identify TPP as problematic, acknowledging that some people support it, then we moved at the overall platform committee, saying that the standards for a decent trade deal would be no investor-state provisions, no lengthening of the intellectual property for medications, no use of human trafficking. And we put those standards in the new—in the latest version, and that did make it in. But I agree with my colleagues that we should take a position against TPP. You know, most Democrats are against it. And when I say most, I mean as many as 85 percent of House Democrats oppose TPP. The rank-and-file Democrats across the nation are against it. And the only person who I can find who’s really, really for it is maybe 13 House members, a handful of senators and the president of the United States, Barack Obama. It is the Democratic position that we’re against TPP. The minority, though it contains some really powerful people, is in favor of it. So the platform should reflect the position of the overwhelming number of Democrats, which is anti-TPP. AMY GOODMAN: And, Congressmember Keith Ellison, the issue of single-payer healthcare, the idea of Medicare for all, the party shying away from Bernie Sanders’ proposal to turn Medicare into a single-payer healthcare system for this country—what happened? REP. KEITH ELLISON: Well, yeah. As you said, you know, that proposal, which is very meritorious and which I support, was not embraced. That’s too bad. But let me tell you, you know, we debate—I guess, Amy, I’m an optimistic person. Right? Whenever we don’t get every single thing that we want, it’s not my way to say, “Pooh-pooh on the whole process.” I say we have made important demands and debated this issue. We have made them pay attention to what we’re talking about. And the struggle continues. We’re not going to stop fighting for Medicare for all just because it didn’t get adopted into the Democratic platform. We’re going to keep the fight alive, because people all across the country need it that way, because it is a more humane, more effective way to deliver healthcare to the American people. So I just say, you know, take heart in the success that we had. Keep the battle going. Keep the fight up for a fairer, more equal America. That’s what we do. AMY GOODMAN: You know, that’s an interesting point, because just on a point on process, is it true that even if you lose at the Democratic platform level, in this meeting that you’ve had in the determination of the platform, 25 percent of voters could sign a minority report that would allow for an amendment to come up again at the national convention in Philadelphia? AMY GOODMAN: Now included in the platform, you’ve adopted language against the death penalty? REP. KEITH ELLISON: Isn’t that wonderful? I mean, I think that that is—boy, talk about an idea that’s time has come. I mean, the death penalty—literally, hundreds of people exonerated from death row, clearly administered along race and class lines that disadvantage people who don’t have privilege in our society. Time to get rid of the death penalty and join the rest of the world. The Democratic Party stands for that, and that’s a good thing. And I’m proud of that. And I want people to know that we are shaping the Democratic Party in a progressive direction. Progressive ideas are ascendant. We are moving the ball forward. And this is the time to get involved and help defeat Trump. AMY GOODMAN: Now, Politico talks about the language adopted in the platform. They describe it as “sharp language on Wall Street reform.” What does that mean, Congressmember Ellison? REP. KEITH ELLISON: Well, I think that they don’t really appreciate the fact that the role of Wall Street is to take people who have money to invest and put it into businesses that need the investment. That’s what they’re supposed to do. That’s all they’re supposed to do. But what they’ve done is use that intermediary role to reap massive profits for themselves and to put the economy at risk. And, you know, there is this philosophy that any regulation of business is somehow interfering with this sacrosanct market concept and should be discouraged. I disagree with that entirely. I think that whenever businesses harm the economy, harm workers, harm consumers or undermine human rights in any way, then it is the role of the government to make sure that they don’t do that and to make sure that markets are fair and they operate properly. That is all that the platform is saying. It’s not sharp. If you are a person on Wall Street who wants to do what Wall Street is intended to do, there is nothing in the platform that should bother you, not one single word. In fact, if you really believe in what you’re doing, you should be happy that the Democratic platform is trying to make sure that we’re heading in the right direction. Unfortunately, you know ,some people who believe that they’re entitled to make triple-digit profits, triple—you know, just massive, rent-like profits, they’re upset because they’re entitled in their outlook on life. REP. KEITH ELLISON: John Lewis. AMY GOODMAN: —John Lewis from Atlanta. REP. KEITH ELLISON: Katherine Clark. REP. KEITH ELLISON: David Cicilline. Yeah. AMY GOODMAN: Tell us why you decided to sit down that day and how that relates to what we’re seeing in this country, as President Obama heads to Dallas to remember the people killed by the sniper, using a weapon, automatic weapon, semi-automatic weapon. AMY GOODMAN: Congressmember Ellison, your mother told you to go sit on the floor? REP. KEITH ELLISON: Well, you know what? Yes, she did. I will say, honestly, and my mother will tell you, too, that she didn’t need to coax me to get to the floor, because I was headed there anyway. But I was always happy to hear from mom, who taught me to stand up for what’s right, no matter what. And so, I got a note from her, and I handed it to a friend of mine. We laughed. He took a picture of it and tweeted it, and it kind of went viral, to tell you the truth. REP. KEITH ELLISON: She just sent me a note saying, “Hey, man, how come you’re not on the floor?” And I had a long—I had been on the floor, but I had a meeting that I had to do, so I went to my meeting and was planning on going back. While I was in the meeting, she sent me a note and said, “Hey, go to the floor.” And, you know, I always try to do what my mom says. AMY GOODMAN: So, this issue, as President Obama cut short his trip and heads to Dallas, the issue of police brutality, the issue of gun control, the issue of the violence that took down these officers—what do you think needs to happen, Congressmember Keith Ellison? REP. KEITH ELLISON: Well, I think we—I believe we need an assault weapon ban. That’s my opinion. We had one up until 2004. I also think that we need to do a whole number of things. There’s like a whole laundry list. I mean, no country in the world has the number of handgun deaths that we have. We have an epidemic here. When they shot Gabby Giffords in the face and killed members of her staff, we did nothing. When they killed 20 little kids and seven of their teachers in Sandy Hook, we didn’t do a thing. When they killed people at a theater, we didn’t do a thing. And now, here they kill 49 people at a nightclub. We had to do something. I think that the list of what we should do is not the hard part of it. The hard part of it is to get the Republican majority to allow a vote on the critical issues facing the American people. That is the tough side of this thing, and that is why we had to sit in. And I think you can—you can bet that there’s going to be much more social justice activism toward getting sane sensible gun laws in this country. We are out of control. And I will tell you this. This issue is a lot like other issues we face. Why? Why can’t we get climate change legislation? Because the big monied interests prohibit it, and they have influence on members of Congress. Why can’t we get real, sane, sensible gun legislation? Because the NRA, funded by Mossberg, Smith & Wesson, Glock and all the rest of the big dogs in the weapons industry, you know, spread around donations and won’t let it move through. It is a lot like every other issue where big monied interests basically stranglehold Congress, and we can’t move anything forward. So, people need to understand there is a economic analysis here, there’s a money-in-politics angle to this, and that’s why need everybody to participate in this democracy. It’s going to take a lot to overcome these big dollars. But we have the many people. They got the many bucks. I think the people overcome the bucks. AMY GOODMAN: Congressman Ellison, I wanted to ask you about Jamar Clark, the unarmed 24-year-old African American who was killed by Minneapolis police last year, authorities saying Clark was shot in the head after a scuffle with officers who responded to a report of an assault, but multiple witnesses saying Clark was shot while handcuffed. His death sparked a series of protests in Minneapolis, including a weeks-long occupation outside the Fourth Police Precinct. You’re among many who called for the release of the videotape of Jamar Clark’s fatal shooting. How does this killing fit into the response of the people and the protesters today? REP. KEITH ELLISON: Well, you know, that was something that happened during the winter months in Minnesota. And for 18 days, you know, people stood in the blistering cold to put their bodies on the line to show how outraged they are at the shooting of Jamar Clark, which, of course, was just one in a long train of shootings that has happened in Minnesota and around the country. So, yeah, I demanded not just release of the tape, but also that we not use the grand jury, that there be accountability, that we address the underlying economic problems that make for these horrible and unfortunate police incidents. And, you know, the truth is, is that Governor Dayton and many others stepped forward and put unprecedented amount of money into trying to address the racial disparities that exist in our state. In this particular case, you know, we didn’t end up with a prosecution, which I think, you know, is fair to question, you know, the decision making. But because we didn’t have it whitewashed with a grand jury, at least the evidence is there to analyze and even to second-guess the prosecutor, which is our right as American citizens. So, I mean, at the end of the day, you know, as a person who believes in the Constitution, due process, presumption of innocence, it’s hard for me to call for somebody to be convicted. But I do call for them to be held accountable. And I do trust that if the jury is selected on a fair basis, that accountability will happen. Most times, it never even gets to that point: They’re never even charged at all. So I think that, you know, although the outcome was unsatisfying for many people in my state, we did raise the issue to the point where nobody in Minnesota can ignore the police-community problems that we’ve been experiencing, just like the rest of the country. And so, you know, I’ll also say that I really want to commend Governor Dayton, because in the Philando Castile case, he said that, you know, “I wonder whether or not, if Philando was white, this would have happened to him. I have a feeling that it would not,” which, to me, is a pretty startling thing for someone to say, a white governor of a major state like Minnesota openly saying that race was a contributing factor, or likely to be a contributing factor, not in the heart of the officer who did the shooting, but because we are—black—African Americans are so highly overrepresented in officer-involved shootings. I mean, that’s a good thing, and it shows that we—that his candor is provoking a national dialogue on race and racial justice in our country, which I think is really important. But we are living in the wake of the Jamar Clark case. There’s no doubt about it. It is informing decisions right now in the state of Minnesota, just like all these other cases are informing decisions that are being made in the localities where these other incidents have happened. It’s a national epidemic. You know, so, we have Alton Sterling down in the Deep South, in Louisiana, Baton Rouge. We have Philando Castile in the up North. And we have them on the East and the West and all in the middle. It’s a national problem. It needs a national focus. AMY GOODMAN: And finally, will you be endorsing Hillary Clinton or another candidate, Congressmember Ellison, a longtime Bernie Sanders supporter? REP. KEITH ELLISON: Let me tell you this. I’m not going to run ahead of Bernie Sanders. I’m going to let—look I pledged my support to Bernie. When Bernie weighs in on what he’s going to do, then I’ll weigh in on what I’m going to do. I know that I have the right to say who—what I’m going to do right this moment. But I definitely believe that after Bernie has put his whole life on hold to run for president and has done such a tremendous job, winning 22 states, that I think that we should at least give him a chance to have his say. And then, at that time, you know, I’ll weigh in and make my points known. I’ll say this, though. I am not one of those people who has contempt for Hillary Clinton. I think she’s served our nation. I think there are things that she’s done that are very good. I think there are policies that she’s taken that I don’t agree with. But I’ll tell you this: She’s 10,000 times better than Trump, who I believe is a danger to the republic and would definitely pull our country back, further back than the '50s. And so, I'll make myself clear at the right and proper time. At this time, I’m going to let Bernie weigh in, and then I’ll be—then I’ll make myself clear. AMY GOODMAN: Well, I want to thank you for being with us, Democratic Congressmember Keith Ellison of Minnesota, co-chair of the House Progressive Caucus, also the first Muslim member of Congress. AMY GOODMAN: He’s speaking to us from Washington, D.C. This is Democracy Now!, democracynow.org, The War and Peace Report. I’m Amy Goodman.